Bhimbetka rock shelters are the ancient archaeological site which is located in the district of Raisen in the state of Madhya Pradesh, India, located about 45 km northeast from Bhopal. 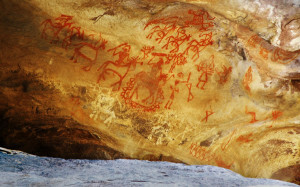 The Bhimbetka area shows the traces of human life. Analysis shows that some of the shelters that have been found were inhabited by the hominids that are like the Homo erectus that was found almost 1,00,000 years before from now. 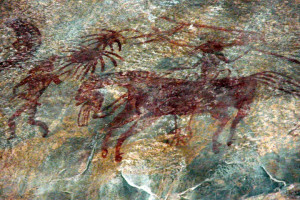 The Stone Age rock paintings that are found in the Bhimbetka rock shelters are 30,000 years old. The name Bhimbetka comes from the name Bhima who was a deity. He was a hero with immense strength and vitality. Normally the term Bhimbetka is derived from the word Bhimbetka which means the sitting place of Bhima. The shelters of rock are found in the area of Raisen which is 45 km in the south of Bhopal near the southern edge of the Vindhyachal hills. Sapura ranges lie in the south of these rock shelters. Only 15 caves are open for the general public but actually there are a total of 700+ caves spread over a 10×4 km area. The most famous Bhimbetka cave is the Zoo Rock where some paintings made with limestone dating back to 10,000 BC and also some paintings made with vegetable colors and iron ranging between 5,000 years and 7,000 years ago. The area has huge vegetation with immense natural resources. It also consists of rich flora and fauna biodiversity, perennial water bodies and natural shelters. This is the best spot for people who are eager to have a great time in the lap of nature.